If you have any opinion regarding our restorative and cosmetic dentistry services, click here. “I was really pleased with the service, results and price of the treatment. I had only 11 days, and I needed a lot of dental work done. Dr. Pelcman did his best and finished all the work I needed with a great quality. After coming back home I realized that Dr. Pelcman didn’t charge me for extra root canal he had to treat in addition to the estimated work. Thank you! I recommend Dr. Pelcman’s clinic for the great service, personal attention and good price. “They were absolutely wonderful. I had an appointment for the day after you contacted them for me, which was yesterday. He had a patient already, though it was a holiday, and he fixed my problem and did a cleaning. His secretary was even fantastic. I certainly would recommend them without hesitation. “Their office is impeccable,with the state-of-the-art equipment in any USA office such as wide angled 360 degree xrays, and a team of technicians working full time doing all the necessary works. This is a major advantage because Dr Pelcman oversees all the work and he has hired very experienced and talented laboratory experts. One year later, I visited another dentist for another cleaning, and once again the dentist was very impressed of the work done by Dr Pelcman, and she asked me to let another dentist in the office to see the work. He liked it very much. My impression of their office and the work was done well, and that was enough for me.Later, however, I did some cleanings and check ups in offices here in the USA where I live and one dentist I asked what do you like best the work on the right or the left. She answered quickly, the one on the left is excellent. She was referring to the work done by the team at Dr Pelcman’s office. Usually we do not go around showing off dental work, it is not seen, but only dentists can tell the difference… so this is what happened to me, I felt great with the work Dr Pelcman did for me, but also later three other dentists told me it was more than excelent. Drs. 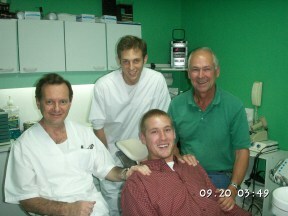 Pelcman’s Practice is an established cosmetic dentistry and dental implants Buenos Aires provider. Lead dentist Dr. Samuel Pelcman has been practicing dentistry for more than 35 years and has provided many patients with dental crowns, teeth whitening, dentures and root canal therapy in Buenos Aires.